…to get ready, this dress is easy-peasy to wear, and super-comfortable too. Clever seams give you a flattering shape, while pockets come in handy for storing all your little bits and pieces. It's made from thick cotton fabric that will smooth your silhouette and is printed with striking patterns. Can you even call it a wardrobe if it doesn’t contain a wrap top? This dress-up, dress-down hero (with clever fixed wrap, FYI) is expertly constructed from a drapey, stretch jersey and has subtle front ruching to really flatter. Cups of tea. Fluffy dressing gowns. Long country walks. 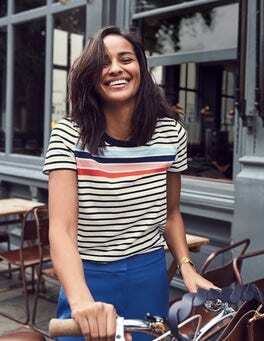 Some things are weekend non-negotiables – and this Breton tee is one of them. We have updated the classic style with a crew neck, short sleeves and tweaked the fit to make it a bit easier. Like you on holiday, this summery dress is very relaxed. Cotton modal makes it soft and breathable, while the voop neckline and flirty frilled sleeves deliver structure. Pull on over a bikini and pair with metallic sandals to look laid-back. You know those dresses that you can always rely on to make you look good? This midi is one of those. Flattering ruching and soft, drapey fabric make it a dream to wear. The boatneck and piping detail adds a stylish, contemporary touch to this waist-defining dress. There's a reason why this dress is a bestseller season after season. The wrap detail on the bust... The cinched-in waist... The soft A-line shape... It all adds up to a wardrobe classic that you'll wear and wear. You’ll see what we mean. This feminine wrap dress is ideal for garden parties. It's crafted from a linen blend and features a V-neck, along with frill detailing on the front. Team with statement strappy heels for maximum impact. Who doesn’t love a shirt dress? This modern classic combines short sleeves, a tie waist and a full, flared skirt to deliver a casual-chic effect in one simple piece. Yes, it is exactly what your wardrobe needs. You know that amazing feeling when you try on a dress that drapes like a dream? This supremely comfortable jersey number will give you just that. Waistline ruching creates a flattering effort, while secret pockets add a practical element. Every wardrobe needs a 'whatever the weather' dress. So step forward this flattering A-line design. With its high-impact jacquard pattern and relaxed fit, it makes being stylish seem effortless. This floaty dress is a wardrobe game-changer. It has a soft curved hem that's brightened up by contrast-colour panelling. Featuring a full skirt for movement, it's made from ultra-drapey viscose. All you need is a pair of heels and you're out the door. Strawberries and cream, daisy chains, soft jersey dresses with woven Peter Pan collars: these are just a few of our favourite things. So we blended them all into this cotton-modal design. It's got poppers down the back to ease the changing routine. Google 'office sophistication' and this boat-neck shift dress is the top hit – or at least it should be. The feminine contrast stitching creates a figure-hugging shape and the cotton blend makes it ultra comfortable. Finished with flattering cap sleeves, this dress is a winner at work events. 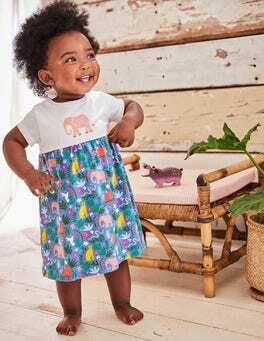 Our classic jersey dress with cute animals and matching knickers guarantees plenty of oohs and ahhs when the family peeps into the pram. 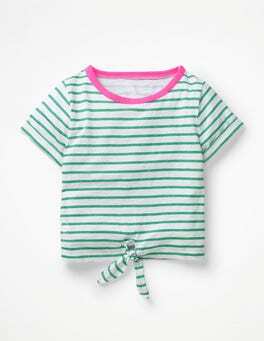 The 100% cotton is soft against baby's skin and a line of poppers down the back ensures fuss-free changes. Diary filling up? There’ll be no more last-minute dress hunting with this stylish midi dress in your wardrobe. The wrap-around fit allows you to adjust it to suit your figure (think made-to-measure elegance), while the full skirt and short, fluted sleeves add feminine finishing touches. Life's too short to bother with a skirt and a jumper. Especially when you can get both in one design. This clever little number combines a long-sleeved jersey top with a full, flouncy woven cotton skirt. It's covered in either fluttering daisies, 3D sequins or a bold rainbow stripe. Why walk when you can float? This chic kimono-style dress has all the ingredients for sailing your way through the day. See the flattering fitted bodice offset by a full skirt, a hanky hem and the in-house-designed floral print with a contrast trim. …No matter the occasion, this fluted-sleeve midi dress will have you event-ready in seconds. The wrap V-neckline has a flattering plunge, while a gathered waist cinches you in. This design is printed all over with our favourite hotchpotch florals and finished with a feminine handkerchief hem. …jumpsuit. It's made from soft material that drapes elegantly. What's more, it's completely zip-free for step-in style, and even has handy pockets. The wraparound shape is semi-fitted with a mid-length cut and works well with flats or high heels (depending on how likely that bus sprint might be). …on exotic shores or just in your imagination, this jumpsuit will get you into holiday mode. It's soft and flowing with a nipped-in waist and relaxed leg for a flattering look. With gathered, short sleeves and a keyhole back, the end result is an off-duty hero piece that's comfortable and feminine. Whether thrown over a bikini on the beach or worn with shorts for sunny weekends at home, this tunic is the comfortable piece you've been waiting for. The pure linen fabric is breathable and the contrasting embroidery adds a tropical feel. We know you usually like to leave your shirts behind when you go on holiday, but hear us out on this one. Slip into this cotton-linen blend shirt-style playsuit and get exploring sunny streets. Thanks to the stand collar and fitted shape, it's smart enough to pair with heels in hotel bars too. …This casual short-sleeved playsuit works hard to keep you looking stylish wherever you're headed. It's made from a soft and drapey cotton blend, with a wrap neckline and detachable belt to create a polished finish. Team it with wedges for ultimate poolside chic: wide-brimmed hat and shades optional. Wrap up your little one in organically-grown cotton with our three-pack of bodies – we firmly believe you can never have too many. 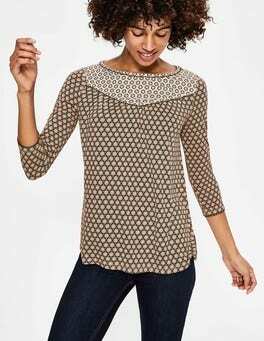 Each one is decorated with a playful print, with nickel-free poppers and an envelope neck for easy-going changing. The pack also comes with a handy drawstring bag. When is a T-shirt not just a T-shirt? When it's a versatile tie-front top with turned up sleeves. Made from textured cotton slub for breathability, it comes in nautical stripes or a pineapple print. It can be dressed up with jeans or a skirt for a party, or dressed down with shorts for the beach.